By the turn of the 20th century, several evaporative methods of recycling cooling water were in use in areas lacking an established water supply, as well as in urban locations where municipal water mains may not be of sufficient supply; be reliable in times of demand; or otherwise adequate to meet cooling needs. In areas with available land, the systems took the form of cooling ponds; in areas with limited land, such as in cities, it took the form of cooling towers. These early towers were positioned either on the rooftops of buildings or as free-standing structures, supplied with air by fans or relying on natural airflow. An American engineering textbook from 1911 described one design as "a circular or rectangular shell of light plate — in effect, a chimney stack much shortened vertically (20 to 40 ft. high) and very much enlarged laterally. At the top is a set of distributing troughs, to which the water from the condenser must be pumped; from these it trickles down over "mats" made of wooden slats or woven wire screens, which fill the space within the tower." 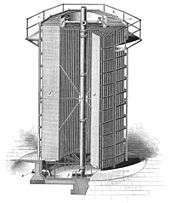 A hyperboloid cooling tower was patented by the Dutch engineers Frederik van Iterson and Gerard Kuypers in 1918. 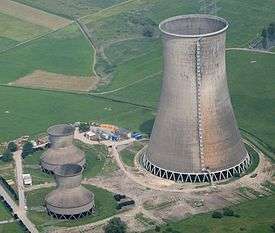 The first hyperboloid cooling towers were built in 1918 near Heerlen. The first ones in the United Kingdom were built in 1924 at Lister Drive power station in Liverpool, England to cool water used at a coal-fired electrical power station. 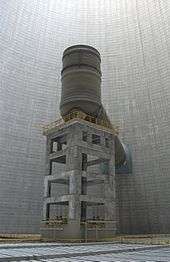 If that same plant had no cooling tower and used once-through cooling water, it would require about 100,000 cubic metres an hour and that amount of water would have to be continuously returned to the ocean, lake or river from which it was obtained and continuously re-supplied to the plant. Furthermore, discharging large amounts of hot water may raise the temperature of the receiving river or lake to an unacceptable level for the local ecosystem. Elevated water temperatures can kill fish and other aquatic organisms (see thermal pollution), or can also cause an increase in undesirable organisms such as invasive species of Zebra mussels or algae. A cooling tower serves to dissipate the heat into the atmosphere instead and wind and air diffusion spreads the heat over a much larger area than hot water can distribute heat in a body of water. 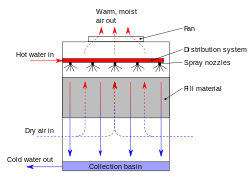 Evaporative cooling water cannot be used for subsequent purposes (other than rain somewhere), whereas surface-only cooling water can be re-used. 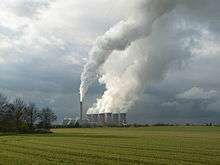 Some coal-fired and nuclear power plants located in coastal areas do make use of once-through ocean water. But even there, the offshore discharge water outlet requires very careful design to avoid environmental problems. Mechanical draught — Uses power-driven fan motors to force or draw air through the tower. Induced draught — A mechanical draft tower with a fan at the discharge (at the top) which pulls air up through the tower. The fan induces hot moist air out the discharge. This produces low entering and high exiting air velocities, reducing the possibility of recirculation in which discharged air flows back into the air intake. This fan/fin arrangement is also known as draw-through. Forced draught — A mechanical draft tower with a blower type fan at the intake. The fan forces air into the tower, creating high entering and low exiting air velocities. The low exiting velocity is much more susceptible to recirculation. With the fan on the air intake, the fan is more susceptible to complications due to freezing conditions. Another disadvantage is that a forced draft design typically requires more motor horsepower than an equivalent induced draft design. The benefit of the forced draft design is its ability to work with high static pressure. Such setups can be installed in more-confined spaces and even in some indoor situations. This fan/fill geometry is also known as blow-through. Fan assisted natural draught — A hybrid type that appears like a natural draft setup, though airflow is assisted by a fan. 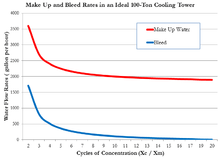 Quantitatively, the material balance around a wet, evaporative cooling tower system is governed by the operational variables of make-up flow rate, evaporation and windage losses, draw-off rate, and the concentration cycles. 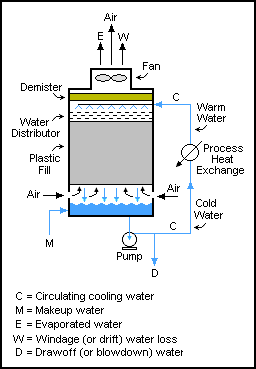 In the adjacent diagram, water pumped from the tower basin is the cooling water routed through the process coolers and condensers in an industrial facility. The cool water absorbs heat from the hot process streams which need to be cooled or condensed, and the absorbed heat warms the circulating water (C). The warm water returns to the top of the cooling tower and trickles downward over the fill material inside the tower. As it trickles down, it contacts ambient air rising up through the tower either by natural draft or by forced draft using large fans in the tower. That contact causes a small amount of the water to be lost as windage/drift (W) and some of the water (E) to evaporate. The heat required to evaporate the water is derived from the water itself, which cools the water back to the original basin water temperature and the water is then ready to recirculate. The evaporated water leaves its dissolved salts behind in the bulk of the water which has not been evaporated, thus raising the salt concentration in the circulating cooling water. To prevent the salt concentration of the water from becoming too high, a portion of the water is drawn off/blown down (D) for disposal. Fresh water make-up (M) is supplied to the tower basin to compensate for the loss of evaporated water, the windage loss water and the draw-off water. 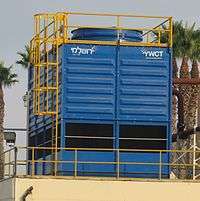 Besides treating the circulating cooling water in large industrial cooling tower systems to minimize scaling and fouling, the water should be filtered to remove particulates, and also be dosed with biocides and algaecides to prevent growths that could interfere with the continuous flow of the water. Under certain conditions, a biofilm of micro-organisms such as bacteria, fungi and algae can grow very rapidly in the cooling water, and can reduce the heat transfer efficiency of the cooling tower. Biofilm can be reduced or prevented by using chlorine or other chemicals. A normal industrial practice is to use two biocides i.e. oxidising and non-oxidising to complement each other's strength and weaknesses and to ensure a broader spectrum of attack. Treated timber — A structural material for cooling towers which was largely abandoned about 10 years ago. It is still used occasionally due to its low initial costs, in spite of its short life expectancy. The life of treated timber varies a lot, depending on the operating conditions of the tower, such as frequency of shutdowns, treatment of the circulating water, etc. Under proper working conditions, the estimated life of treated timber structural members is about 10 years. Pultruded FRP — A common structural material for smaller cooling towers, fibre-reinforced plastic (FRP) is known for its high corrosion-resistance capabilities. Pultuded FRP is produced using pultrusion technology, and has become the most common structural material for small cooling towers. It offers lower costs and requires less maintenance compared to reinforced concrete, which is still in use for large structures. 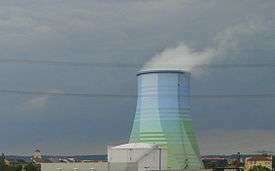 Under certain ambient conditions, plumes of water vapor (fog) can be seen rising out of the discharge from a cooling tower, and can be mistaken as smoke from a fire. If the outdoor air is at or near saturation, and the tower adds more water to the air, saturated air with liquid water droplets can be discharged, which is seen as fog. This phenomenon typically occurs on cool, humid days, but is rare in many climates. During the winter, other sites continuously operate cooling towers with 40 °F (4 °C) water leaving the tower. Basin heaters, tower draindown, and other freeze protection methods are often employed in cold climates. Operational cooling towers with malfunctions can freeze during very cold weather. Typically, freezing starts at the corners of a cooling tower with a reduced or absent heat load. Severe freezing conditions can create growing volumes of ice, resulting in increased structural loads which can cause structural damage or collapse. 1 2 International Correspondence Schools (1902). A Textbook on Steam Engineering. Scranton, Pa.: International Textbook Co. 33-34 of Section 29:"Condensers". ↑ Croft, Terrell, ed. (1922). Steam-Engine Principles and Practice. New York: McGraw-Hill. pp. 283–286. 1 2 3 Heck, Robert Culbertson Hays (1911). The Steam Engine and Turbine: A Text-Book for Engineering Colleges. New York: D. Van Nostrand. pp. 569–570. 1 2 Watson, Egbert P. (1 Jan 1906). "Power plant and allied industries". The Engineer (with Which is Incorporated Steam Engineering). Chicago: Taylor Publishing Co. 43 (1): 69–72. ↑ van Vliet, Michelle T. H.; Wiberg, David; Leduc, Sylvain; Riahi, Keywan (4 January 2016). "Power-generation system vulnerability and adaptation to changes in climate and water resources". doi:10.1038/nclimate2903. Retrieved 28 March 2016. 1 2 3 Snow, Walter B. (1908). The Steam Engine: A Practical Guide to the Construction, Operation, and care of Steam Engines, Steam Turbines, and Their Accessories. Chicago: American School of Correspondence. pp. 43–46. ↑ Cheremisinoff, Nicholas (2000). Handbook of Chemical Processing Equipment. Butterworth-Heinemann. p. 69. ISBN 9780080523828. ↑ U.S. Environmental Protection Agency (EPA). (1997). Profile of the Fossil Fuel Electric Power Generation Industry (Report). Washington, D.C. Document No. EPA/310-R-97-007. p. 79. ↑ Thomas J. Feeley, III, Lindsay Green, James T. Murphy, Jeffrey Hoffmann, and Barbara A. Carney (2005). "Department of Energy/Office of Fossil Energy’s Power Plant Water Management R&D Program." U.S. Department of Energy, July 2005. 1 2 3 4 Milton R. Beychok (October 1952). "How To Calculate Cooling Tower Control Variables". Petroleum Processing: 1452–1456. 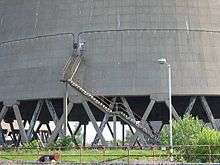 ↑ "Best Management Practice Cooling Tower Management". Energy.gov. Department of Energy. 30 April 2005. Retrieved 16 June 2014. ↑ San Diego County Water Authority (July 2009). "Technical Information for Cooling Towers Using Recycled Water" (PDF). www.sdcwa.org. San Diego County Water Authority. Retrieved 18 June 2014. ↑ Ryan K.J. ; Ray C.G. (editors) (2004). Sherris Medical Microbiology (4th ed.). McGraw Hill. ISBN 0-8385-8529-9. 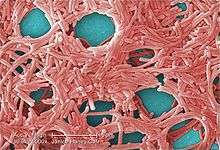 ↑ Airborne Legionella May Travel Several Kilometres (access requires free registration) Archived 22 September 2008 at the Wayback Machine. ↑ National Fire Protection Association (NFPA). 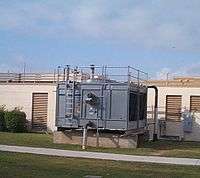 NFPA 214, Standard on Water-Cooling Towers. Wikimedia Commons has media related to Cooling towers.